Brass Monkey Engineering’s Essential Guide to F-GAS...for businesses using air conditioning, heat pumps or refrigeration. F-Gases are the commonest refrigerants in air conditioning, heat pumps and refrigeration systems. They contain HFCs (Hydro fluorocarbons) which affect global warming if they escape into the air. The European Union's F-Gas Regulation No 842/2006 became law on 4 July 2006 to minimise emissions of these gases and is being imposed by a timetable of compliance deadlines. It is now the LEGAL obligation of the end user to ensure that they comply with the F-Gas regulations. 4th July 2009 Only certified companies, such as Brass Monkey Engineering, who employ certified, qualified personnel, can take delivery of refrigerants covered by the F-Gas Regulation. 1st January 2010 No virgin HCFC e.g. R22 can be supplied or used for servicing existing equipment. 4th July 2011 Companies that carry out installation, maintenance or servicing of stationary refrigeration, air conditioning, and heat pump equipment must LEGALLY hold a full company certificate. Brass Monkey Engineering is registered with REFCOM (company number REF1007840) to carry out such work and you can check our certification by visiting www.refcom.org.uk. Personnel carrying out installation, service, maintenance, recovery or leak checking on stationary refrigeration equipment containing refrigerants covered by the F-Gas Regulations, must have obtained one of the recognised (CITB J11 or City &Guilds 2079) national qualifications. 1st January 2015 No recycled or recovered HCFC e.g. R22 can be supplied or used to service existing equipment. This date is currently under review by the European Commission and may be brought forward to 2012 for industrial process refrigeration. All leakage checks must be carried out by certified competent personnel only. 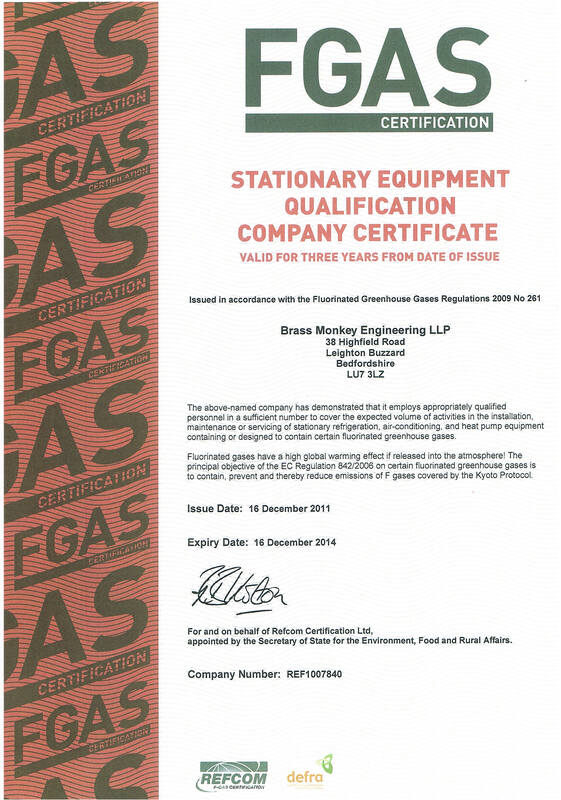 Brass Monkey Engineering will ensure that you are complying with the law regarding F-Gas, we supply you with an F-Gas log which must be kept on site. If you require we can visit your premises to carry out an F-Gas evaluation, and provide you with a report on what action needs to be taken to meet these LEGAL requirements. Please don’t hesitate to contact us for any further information you may need.